Nearly one month ago, the speed limit of the “Ruwais to Abu Dhabi” highway was increased back to 140 km/h. 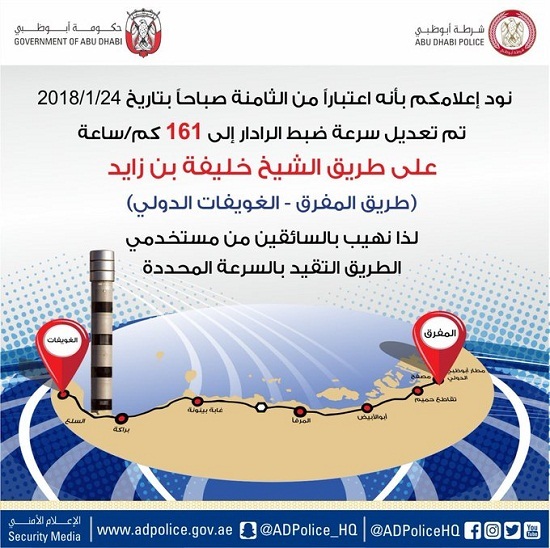 Today, Abu Dhabi Police has announced that you can go further than that, the new speed limit being 160 hm/h. If you know arabic, read the below “tweet”. For the english version of the announcement, a simple google search will provide you plenty of results. For example: The National covering this story. Also, i want to point out the obvious consequences of going 1 km/h above the speed limit. Starting from 161 km/h the radar will flash you, and you will get a speeding ticket. Share with your friends and family in Ruwais, or the ones visiting us. We must have noticed, esp. the communiting public using the X81 Ruwais Housing to Abu Dhabi International Airport, that the service has been discontinued effective 01Jan 2018. Do we have any ways to verify why the service was removed, ans is there any other chance that the service will resume?